It was consecrated as "the cathedral" of Valencian pelota in the 19th century. It was the meeting point for pelota players, politicians and bullfighters representing the Valencian modernism. The Pelayo's trinquet has become a historical place for the city of Valencia. Supporters of this sport and Valencian gastronomy all go there. 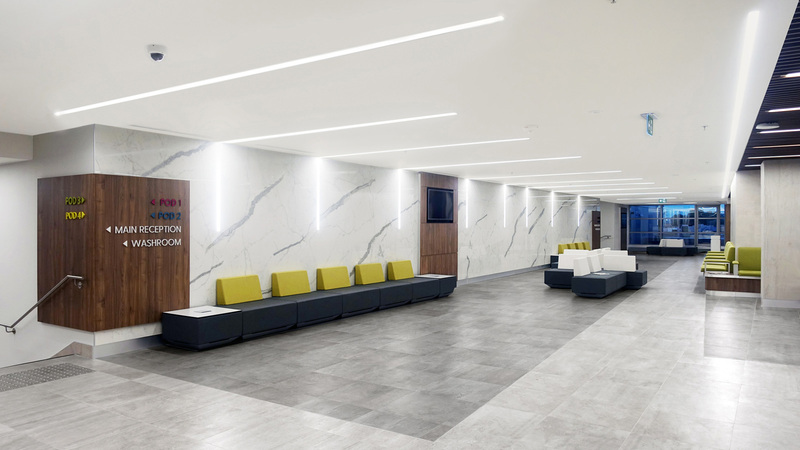 A pilgrimage through time and taste, through the materials that the PORCELANOSA Grupo has in this space. 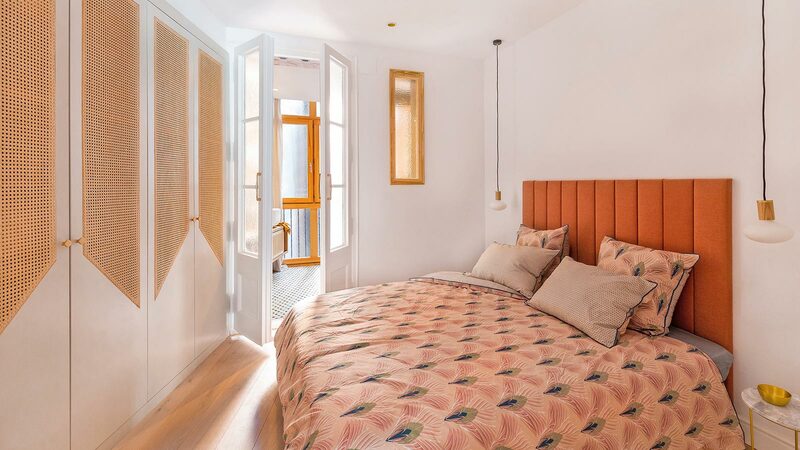 Refurbished by the interior designer, Carlos Serra from the Mercader de Indias studio, the old court has now become the Pelayo Gastro-Trinquet restaurant. 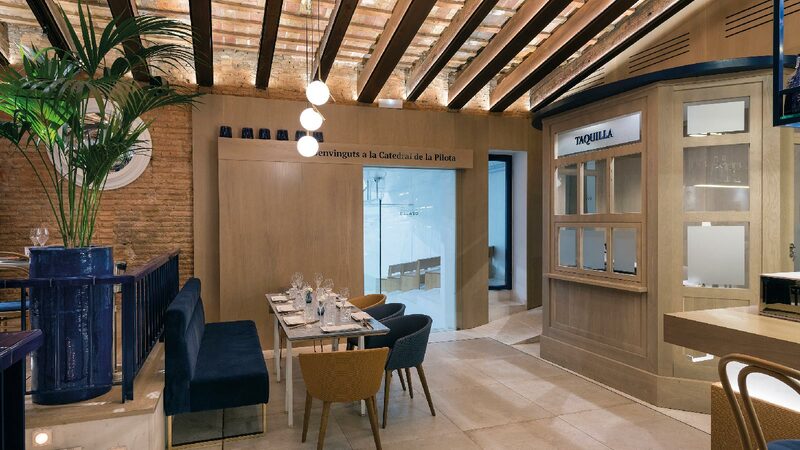 A space which has kept the classic spirit of the Valencian pelota with the new flavours of the regional cuisine. Located in the heart of Valencia, the establishment is divided into two heights to separate the bar and restaurant area with the play area. 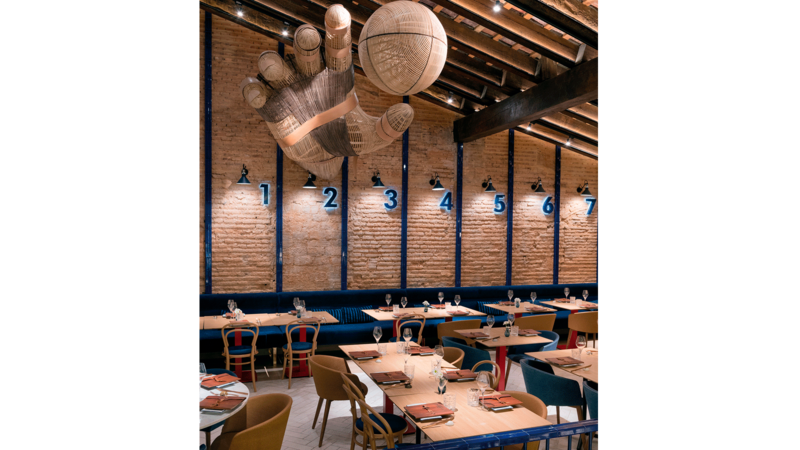 The central part of the restaurant has a sculpture by the fallero artist, Manolo García, which represents the hand of a pelota player with wooden slats. History made sculpture. 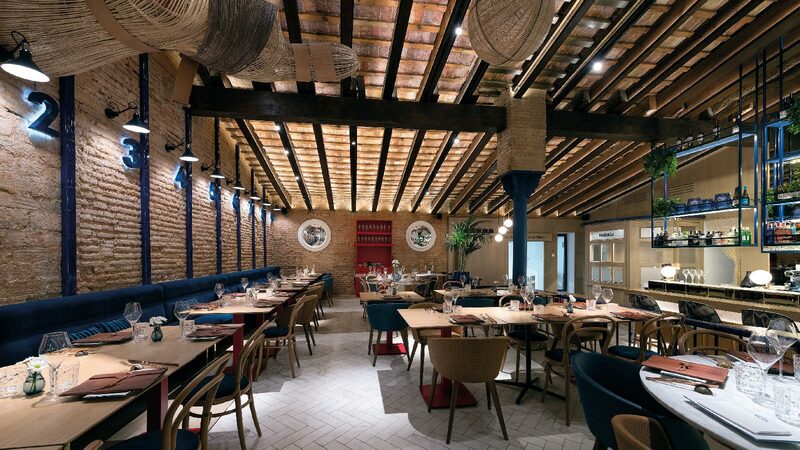 The decoration of the gastronomic space is based on three colours: Red for furniture, blue for the textiles, the kitchen and the bar and the marble white in the counter and the Persian White floor tile by L'Antic Colonial. Heron drawings and plant motifs arranged on the stools represent the plant and animal wealth of La Albufera. A natural place without any limits. Elements that materialise the extension and the flavours which come from the Valencian garden. 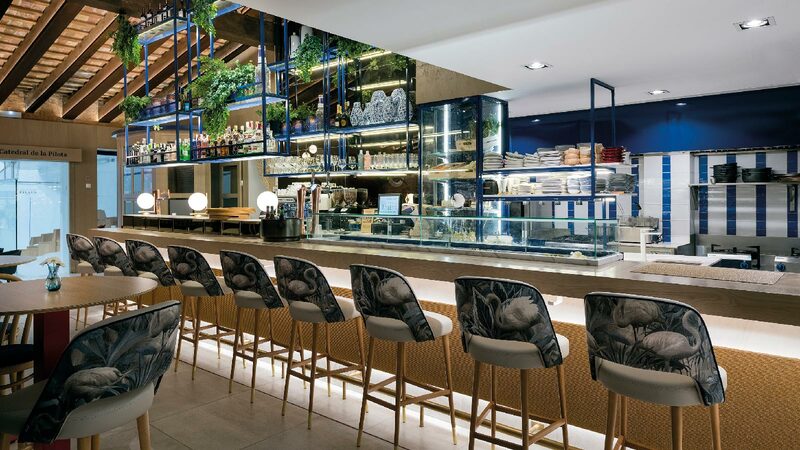 The essence that is concentrated in each dish from the chef, Pablo Margós, is capable of merging the traditional recipes of local cuisine with the most cutting-edge textures. 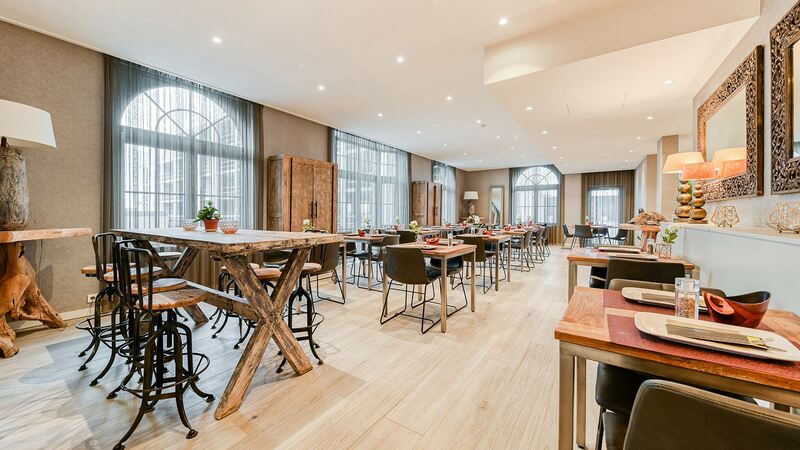 The bathrooms in the restaurants keep the current lines renewed, thanks to the Urban taps and the Glove II and Jam basins by Noken Porcelanosa Bathrooms. 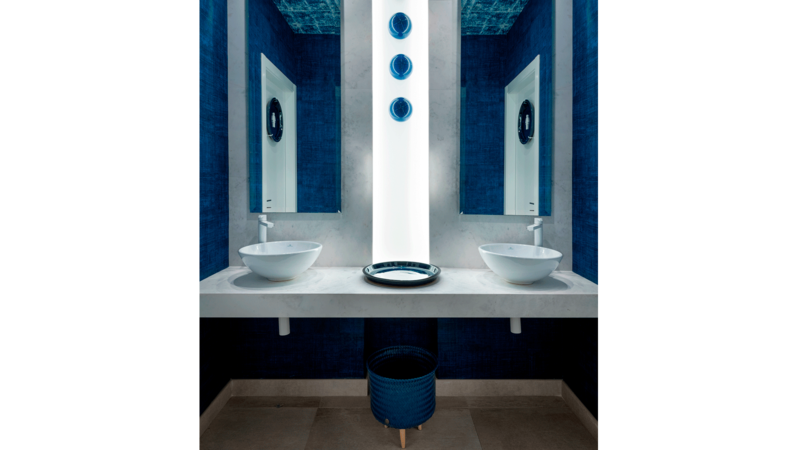 The pure white and blue provide a fresh contrast to the space without losing any of the elegance that Carlos Serra captures in every detail. The flooring is completed with the Manhattan Maple by Porcelanosa, Newport by Venis and Pro-Part Brass Old Bronze by Butech, which gives the right touch of exclusivity in the trinquet itself. Gastronomy, culture and sport all go in one dish.